Actor Tom Felton ( Harry Potter) performs the origin story of Guenhwyvar, Drizzt's black panther companion and one of the more mysterious aspects of the Forgotten Realms. Meet Maimun - an orphan who couldn’t imagine how unfortunate it would be to discover a stone that makes him forever lucky. 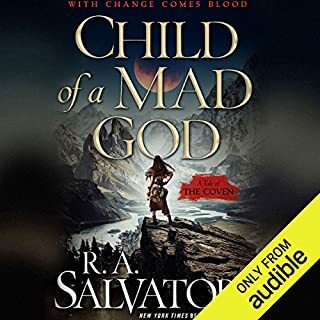 Fleeing a powerful demon named Asbeel, Maimun stows away aboard the ship Sea Sprite, where he encounters a cast of characters well-known to Salvatore fans: Captain Deudermont, Drizzt Do’Urden, Wulfgar, Catti-brie, and the dwarf Bruenor. Drizzt becomes a mentor to Maimun and aboard Deudermont’s ship, they sail the treacherous seas of the Forgotten Realms. 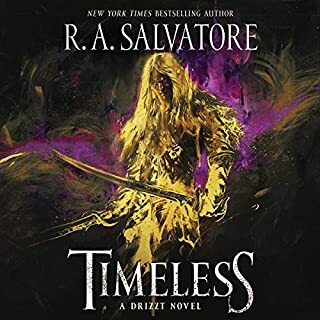 Hunted by a demon, haunted by a mysterious spellcaster, and chased by a pirate, Maimun, with Drizzt’s help, must unravel the secrets of the Stone of Tymora before his luck runs out! 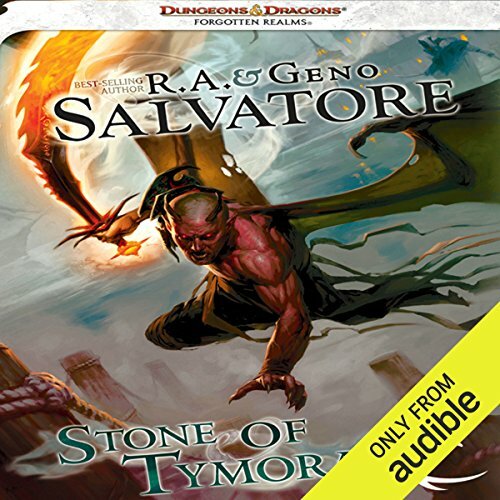 ©2009 Wizards of the Coast LLC (P)2012 Audible, Inc.
Would you listen to Stone of Tymora again? Why? Yes and did. Rebooted it up on a long drive with the youngest boy. Was the first time he didn't care about how fast we got there. At the beginning of the book the main characters were very endearing and it was great to see the places of Forgotten Realms through the eyes of youngsters. However, as the story progressed it became more and more painfully evident that that he was going to keep acting like an immature self-centered arrogant child throughout the story. By the last few chapters, it was so ridiculous that he wasn't changing, and so annoying to listen to second-by-second accounts of all of the fights, that I almost didn't want to finish the book. If the entire plot hadn't been hanging on a few threads that we didn't find out about until the very end, I might have given up. Voice acting was great though. Must Listen! I love it! 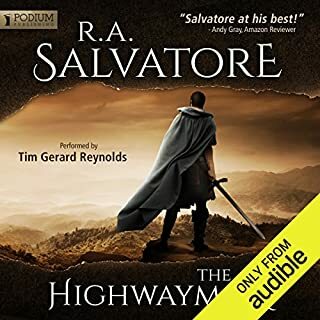 Where does Stone of Tymora rank among all the audiobooks you’ve listened to so far? It's a great book. 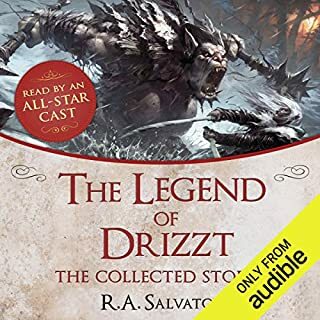 If you like the legend of Drizzt. This is all you! What other book might you compare Stone of Tymora to and why? Figured I'd listen to it since it mentioned Drizzt. But he's makes an appearance here and there. The main character is primarily with Capt Deudermont. In a quick description, its about boy who was cursed with an item that he must destroy before it kills him. And of course there are those willing to kill him to attain his cursed item for its magical properties. 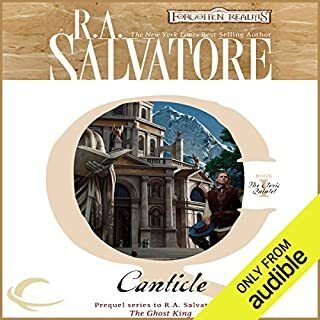 Was really excited to get into this book, having been a long time fan of R.A. Salvatore. After thought, I realize what is missing. 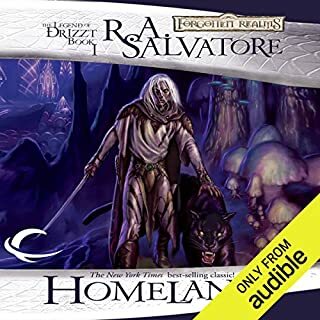 The original drow or story of Drizzt had deep undertones of overcoming racism, lots of moral stories and references, and focused on Drizzt and his internal struggles. This had very little to none of that. Decent story but not one I'd want to read again or follow. Very good, liked the different voices for different characters. Maybe. Why i would because it is not a terrible read. Why I wouldnt, because I prefer a ton of other books that I would recommend first. Most interesting is the story itself, I like the plot, the bad guys, good guys, fantasy characters. I love hearing about Drizzt, Bruneor, Wulfgar and Cattie Brie from a third perspective. Least interesting is the main character and his main companion. I have a hard time "believing" a child his age could accomplish the feats he does and I think the writer is trying to write from a boys perspective, which is also hard to deal with because I no longer see the world from a "woah is me, I am 8 years old and nothing is fair" perspective. What about Ramon DeOcampo’s performance did you like? He does the voices very well and diversely. Although he read a little too slowly with too many breaks for me so I have him on double speed. Was Stone of Tymora worth the listening time? Not the Authors best work, but definitely a better read then some fantasy out there. thoroughly wonderful story. I have enjoyed all of the stories that include Drist. the last hours of this book are incredible. great story, very very good performance by reader. don't need to pay attention, can just turn off you brain and enjoy. Have you listened to any of Ramon DeOcampo’s other performances before? How does this one compare? Good story, not great literary work but come on. There's nothing new under the sun. For people who like to play D&D or just like a good fantasy story this will scratch that itch. Plus it's part of the Forgotten Realms series and features a few cameo appearances of everybodies favorite dark elf.